Clean and cut the banana into small pieces. 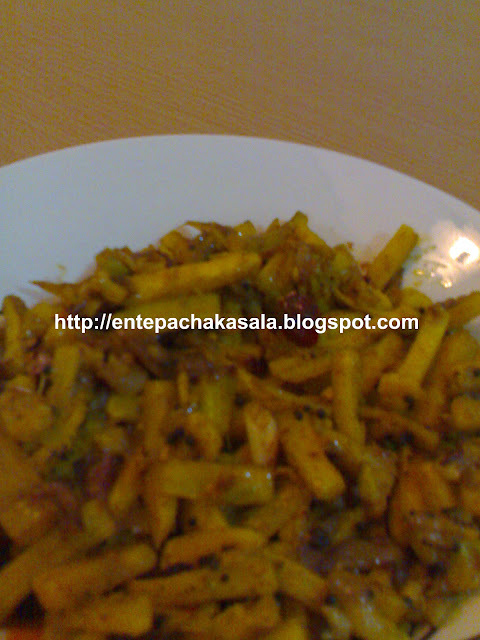 Cook banana with turmeric powder, salt and 2-3 tbsp water till the pieces turn soft. Crush chilli flakes, small onion and garlic. Heat oil in a pan and mustard seeds, when its starts crackle add curry leaves. Add crushed chilli, small onion and garlic. Sauté well untill it turns golden color. Add pepper powder. Add the cooked banana into it and sauté well. Remove from and serve hot with rice. Wow! looks so spicy and yummy. Hmm spicy kaya stir fry jaisy..
What a great n delicious idea...! healthy recipe Jaisy. Love this yummy kaya stirfry.. Fantastic stir fry, very tempting..